Ah, the baby teeth: those cute little pearl buttons that start to appear in a child’s mouth at around 6 to 9 months of age. Like pacifiers and bedtime stories, they’ll be gone before you know it — the last usually disappear by age 10-13. So if the dentist tells you that your young child needs a root canal, you might wonder why — isn’t that tooth going to be lost anyway? The answer is yes, it is — but while it’s here, it has some important roles to play in your child’s development. For one thing, baby teeth perform the same functions in kids as they do in adults: Namely, they enable us to chew, bite, and speak properly. The primary teeth also have a valuable social purpose: they allow us to smile properly. 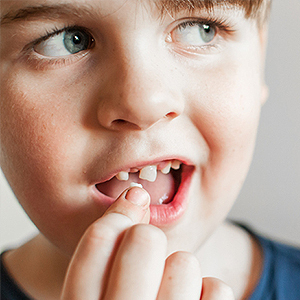 If a baby tooth is lost prematurely at age 6, the child may suffer detrimental effects for five years or more — and that’s a long time for someone so young! Even more important, baby teeth have a critical function in the developing mouth and jaw: Each one holds a space open for the permanent tooth that will eventually replace it — and it doesn’t “let go” until the new tooth is ready to come in. If a primary (baby) tooth is lost too soon, other teeth adjacent to the opening may drift into the empty space. This often means that the permanent teeth may erupt (emerge above the gum line) in the wrong place — or sometimes, not at all. The condition that occurs when teeth aren’t in their proper positions is called malocclusion (“mal” – bad; “occlusion” – bite). It can cause problems with eating and speaking, and often results in a less-than-perfect-looking smile. It’s the primary reason why kids get orthodontic treatment — which can be expensive and time-consuming. So it makes sense to try and save baby teeth whenever possible. Procedures like a root canal — or the similar but less-invasive pulpotomy — are often effective at preserving a baby tooth that would otherwise be lost. But if it isn’t possible to save the tooth, an appliance called a space maintainer may help. This is a small metal appliance that is attached to one tooth; its purpose is to keep a space open where the permanent tooth can come in. If your child is facing the premature loss of a primary tooth, we will be sure to discuss all the options with you. It may turn out that preserving the tooth is the most cost-effective alternative in the long run. If you have questions about your child’s baby teeth, please contact us or schedule an appointment for a consultation.